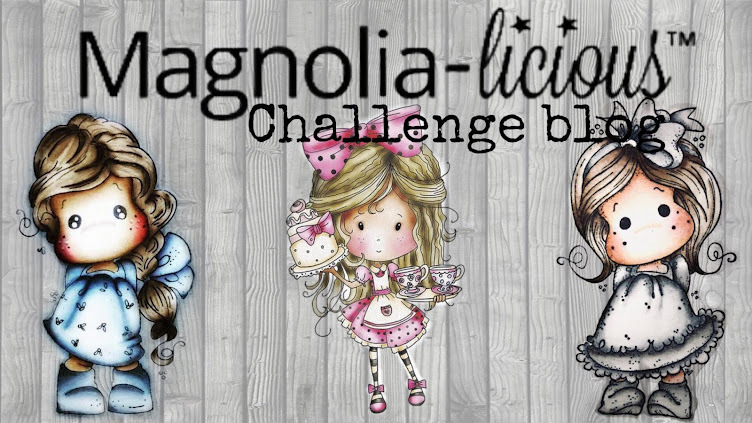 MAGNOLIA-LICIOUS CHALLENGE BLOG: Monday, January 8th - We are back and ready to knock your socks off! Monday, January 8th - We are back and ready to knock your socks off! 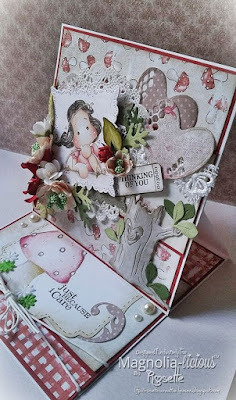 January's Card Challenge and the winner from December will be posted on Tuesday the 9th. 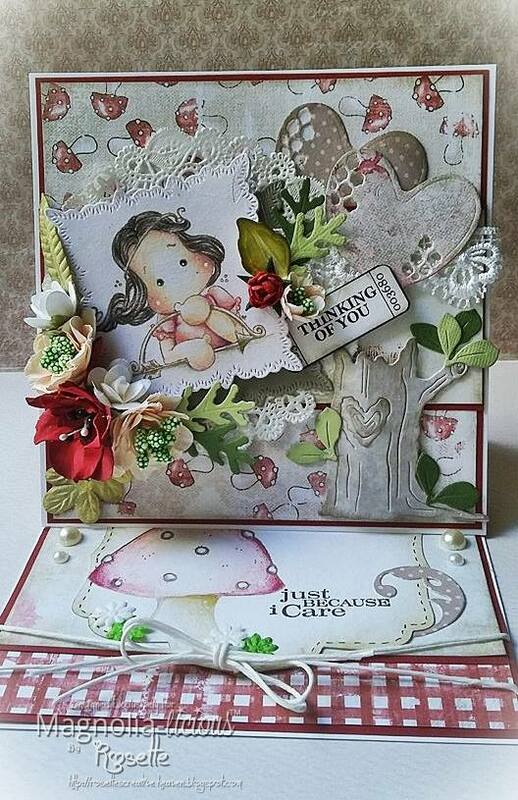 Wow, what an incredible work of art here create by Rosette. Here is what supplies she has used from Magnolia-licious to make this lovely easel card! 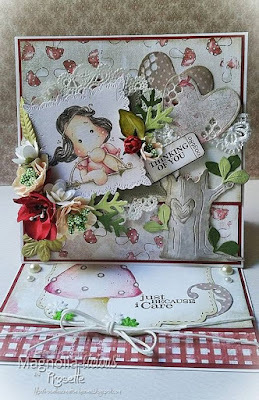 My DooHickey Box Kit vol.10 - (using the heart die), and the Magnolia DooHickey Cutting Die ST17 - Tree Stump. Another Magnolia die is the square doily that the image is stamped on - it is the #127 Vintage Doohickey Die 17 - Small Square. Red and Pale Pink foamiran were used to make the flowers, as well as the black and white Stamens. The large mushroom is also a Magnolia stamp. 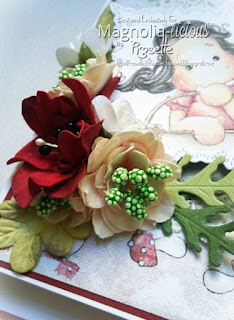 Thank you so very much for sharing your card with us today Rosette, it's just beautiful! 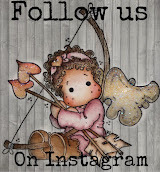 If you go to Rosettes blog, you will find out something fun and exciting that may include a giveaway! We hope you had a delightful Christmas and New Year! We would like to thank you for being a part of our lives and for always stopping by. Your support is unbelievable and we couldn't do any of this without you! Now for news from the Magnolia-licious store. Shawn has some very appealing new Chipboard in the store and it's so well priced you won't believe it! You can find it all listed and shown here. He also has quite a bit of the Get Well Collection available, you can find that all here. Did you know that Shawn also carries charms? They are fun! You can find those here. He carries some Ranger Products too, including the Distress Oxides! Love those inks, and you can find them here. We still have a surprise for you, but haven't managed to get it all ready for the website yet! Should be by next weekend though, if all goes as planned! I am so excited to share it with you!